The GuitarBox Pro bundle delivers everything found in M-Audio’s GuitarBox—the first Pro Tools® recording system designed for guitar players—and turns up the volume with an even more incredible plug-in bundle value. This guitar studio-in-a-box fuses two award-winning products—the M-Audio® Black Box™ amp modeler/recording interface and Pro Tools M-Powered™ music production software. The easy-to-use, compact, high-performance system also includes 45 DigiRack™ and Bomb Factory® plug-ins and the G-Rack™ Producer premium plug-ins bundle ($4,255 value). 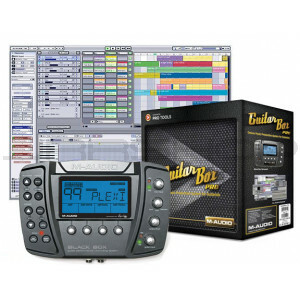 The GuitarBox Pro delivers everything you need to fuel your inspiration and produce your music professionally.